One of the aspects of newborn baby care which we get the most questions about in the first few months of life is feeding, nursing and pumping. At Potomac Pediatrics, we have tried to develop a support system for new moms and dads who may be overwhelmed with all the ins and outs of feeding a newborn- This is one of the many reasons why we have a board certified lactation consultant on staff to help you through what sometimes can be a challenging time. A breast pump, with all of its tubes, parts and switches can be very daunting to a first time parent opens up the box, and often times a new mom will be confused about how, when and why to pump. At Potomac Pediatrics, we recommend that your baby gets their first bottle by 1 month of age and after that at least one 1 bottle per day. We recommend this because breastfeeding and bottle feeding are two different skills and breastfed babies need to practice and be comfortable with both. Here are some step by step guidelines for starting your pumping journey in order to make sure you have enough milk for a bottle to offer your baby. We recommend you start this process around the time your your baby is 3 weeks old. Open your pump, sanitize the parts and watch a youtube video if you are unsure how to use your pump. Have it all set up and ready the night before you want to pump for the first time. After baby’s first morning feeding (around approximately the 6-7 am timeframe) as soon as your baby is giving cues that they seem satisfied and full you will attach your pump and pump for 5-10 minutes (1-2 minutes after the milk stops flowing). Collect the milk (see our breast milk storage guidelines) for a few days (only combine milk if it is same temperature) until you get 2-3 oz together in one bottle. Set a time to give the first bottle and have a friend/relative/spouse/grandmother offer the bottle. Of course, mommy themselves can always offer the bottle but sometimes a child is more willing to take it from someone else who they know does not usually breast feed them. 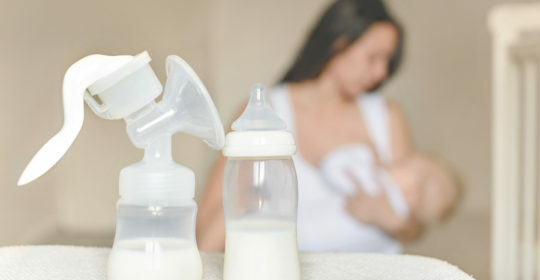 If you’re experiencing difficulties, try to offer a bottle in a place in the house where mom doesn’t usually breastfeed the baby and doesn’t smell as strongly of mom. Questions about pumping or any questions about breastfeeding in general? Call our friendly triage nurses at 301-279-6750. Click here for more information about our board certified lactation consultant Maureen Mills RN, IBCLC and all of the services she provides. Join her on every second and fourth Wednesday of the month from 1-2 for our Newborn Support Group!